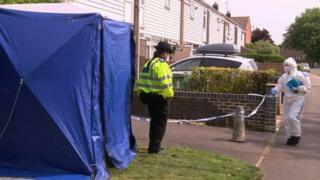 Two more men have been charged with murder after a man died following a fight in Oxford. A brawl broke out on 1 June in Jourdain Road, Blackbird Leys. Christopher Lemonius, 27, was found injured at the scene and died in hospital. Four men and a boy have already been charged with his murder. Otman Lamzini, 24, of Jourdain Road, Blackbird Leys, and Carlos Spencer, 26, of Wynbush Road, Oxford, have also been charged. At an inquest at Oxford Coroner's Court in June, coroner Darren Salter said Mr Lemonius, of Sherwood Place, Barton, had died from multiple injuries. They appeared at Oxford Crown Court on 7 June and have been remanded in custody. They are next due to appear in court on Friday.